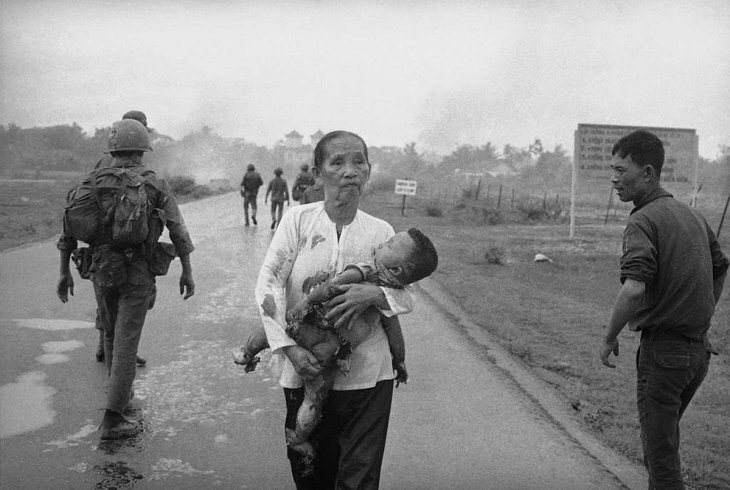 The Vietnam War remains the deadliest war the world has seen since 1945. The Tet offensive was a turning point. For the US, it took away the belief that victory was possible. All that was left was to find a way out. Fifty years ago, in the middle of the night on January 30, the annual weeklong festivities at Tet – the Vietnamese New Year – had just begun when gun shots were heard in the capital Saigon and in multiple other South Vietnamese cities. President Nguyen Van Thieu was celebrating in his wife’s native city of My Tho. The US Army, under the command of General William Westmoreland, focused on defending the Khe Sanh base near the Demilitarized Zone between South and North Vietnam. For nine days it had been under heavy North Vietnamese artillery bombardment in an operation meant to divert US attention from what would be coming next. People first thought they heard firecrackers. Instead, it was the beginning of a hazardous and daringly great offensive. Together with North Vietnamese troops who had strategically infiltrated themselves across South Vietnam, the Front for the National Liberation of South Vietnam (NLF) had been preparing the offensive for a long time. 38 of South Vietnam’s 44 provincial capitals came under attack, including My Tho. The offensive surprised and shocked US President Lyndon B. Johnson, as well as the US public. Thieu was evacuated from My Tho by helicopter. The local NLF did not know that he was there. From the next day, the whole world followed the offensive on TV. The main drama was a failed attack on the US Embassy in Saigon. In the capital, the NLF was defeated over the next few days in a hugely destructive counter-attack. In the old imperial capital Hue, the attackers held their ground for three weeks before being forced to withdraw. The city had then been wrecked by guns and artillery and around 2,800 supporters of the Saigon regime had been massacred. In My Tho and other provincial capitals, the US and South Vietnam regained control but sometimes had to destroy a place “in order to save it”, as a US officer said about Ben Tre. The loss of human lives was huge on both sides, and the fighting continued in the countryside. The infamous American massacre in the village of My Lai took place on 16th March, although it was only disclosed much later. There has been much controversy in both the US and Vietnam about the meaning and impact of the Tet offensive. Some claim that the NLF forces were eradicated and therefore had to be supplanted by North Vietnamese army units in order to keep the insurgency going. Johnson’s main mistake, some say, was his failure to intensify the military effort and destroy what was left of the insurgency. American media are criticized for having depicted a communist failure as a success. These claims have been proven wrong, most recently in The Myths of Tet by Edwin E. Moïse. Although the NLF suffered heavy losses, it remained a strong fighting force and was able to carry out new offensives in May and September 1968. It remained important all the time until its victory in 1975, although the regular North Vietnamese army would play an increasingly dominant role. According to Moïse, the media did indeed report that the Tet offensive failed. A common narrative in Vietnam has been that the main strategic purpose of the Tet offensive was to influence US public opinion. The main goal was thus reached. This myth has been rejected in a number of studies by the historians David Elliott, Merle Pribbenow, Sophie Quinn-Judge, Lien-Hang T. Nguyen, Pierre Asselin and John Prados, as well as in a superbly written general account of the Vietnam War by Fred Logevall and in an overview of modern Vietnam by Christopher E. Goscha. The Vietnamese journalist Huy Duc has moreover published a lengthy book about the internal power struggles among the Vietnamese communists. He is one of the recurring figures in the new remarkable ten-hour TV series about the Vietnam War by Ken Burns and Lynn Novick, which gives an excellent introduction to the Tet offensive. The North Vietnamese leaders did not agree on the plan to launch the Tet offensive. In June 1967, First Secretary Le Duan had to overcome objections from President Ho Chi Minh and Minister of Defence Vo Nguyen Giap before he got the politburo of the Vietnamese Workers’ Party to decide that it would prepare a Great Offensive and General Uprising in the cities and towns of South Vietnam. Ho and Giap preferred sticking to a protracted strategy of rural warfare, which in the end would engulf the cities. They did not think time was ripe for an urban uprising. After the politburo’s decision, Le Duan and his close collaborators Le Duc To and Tran Quoc Hoan had several of Ho and Giap’s advisers arrested. Ho himself was sent to medical treatment in Beijing and Giap dispatched to Budapest. In October, the politburo resolved that the offensive would take place under Tet. Le Duan thought it would be possible to recreate a revolutionary situation of the kind that had allowed Vietnam’s August Revolution in 1945, when enthusiastic crowds helped Viet Minh committees seize power in the great majority of Vietnam’s cities. He reckoned that the South Vietnamese regime would fall apart. The oppressed people in the cities would rise up and help the NLF seize power. After that, it would be possible to put pressure on the US to withdraw. Le Duan miscalculated. South Vietnam had become more stable after the presidential elections of September 1967. In spite of its huge losses, the South Vietnamese army stood its ground. The urban population mostly remained passive. Only the countryside joined the revolution. In the rural villages, the NLF enjoyed massive support. Le Duan must have been astounded when his colossal failure turned into a diplomatic victory. The anti-war movement in the US was energized. 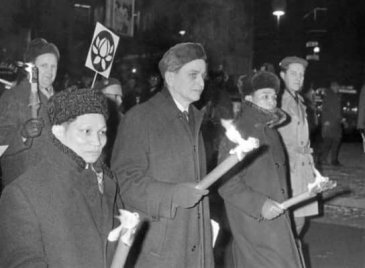 Sweden’s Prime Minister Olof Palme, who had been known as a close ally of the US in its struggle against communism, demonstrated in the streets of Stockholm side by side with the North Vietnamese ambassador to Moscow. The policy makers in Washington D.C. were shattered. At the end of February, President Johnson declared that he wished for negotiations and would not seek re-election as US president. In May, the American and Vietnamese negotiators met for the first time in Paris. The main reason why the Tet offensive was such a shock for the US public was that General Westmoreland and President Johnson had repeatedly made the assertion that the US and South Vietnam were winning the war. The TV series from Ken Burns and Lynn Novick includes an excerpt from Johnson’s State of the Union address on 17th January, reporting significant “progress” in South Vietnam. The contrast between what the Americans had been told and what they now saw on their TV screens could not be sharper. In order to convince the US public that the war had been fought to a stalemate, it was sufficient for the NLF to carry out a great offensive. It did not need to succeed. The war would still last for a long time. Since the end of World War II in 1945, no other war has had as many battle deaths as the Vietnam War. Almost five years passed before the negotiations in Paris led to the Paris Peace Accords, meaning that the US troops could pull out. Two more years were needed before the “Ho Chi Minh offensive” led to the conquest of Saigon, which officially ended the Vietnam War.